The packaging all looks very nice, I find that the eyeshadows are all very shimmery and some even have some pretty large chunks of glitter in but a little glitter is good every now and then. 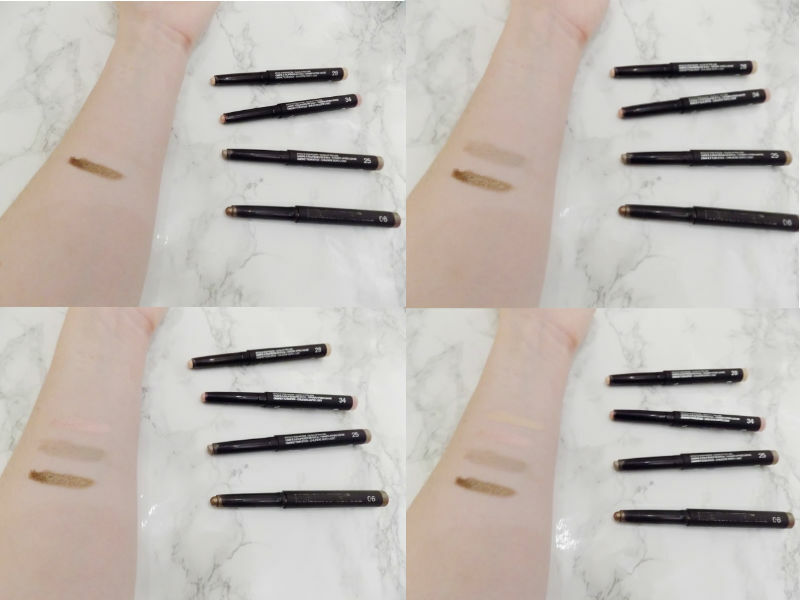 So starting off with what I first tried from the brand, the Long Lasting Shadow Sticks I have the shades 06 which is a bronze-brown, 25 is a matte taupe, 28 is a skin tone, beige kind of shade, and 34 is a shimmery light pink. As I'm sure you can guess, I love the bronze and taupe and they formula is great, long lasting, like it says and very creamy and pigmented. 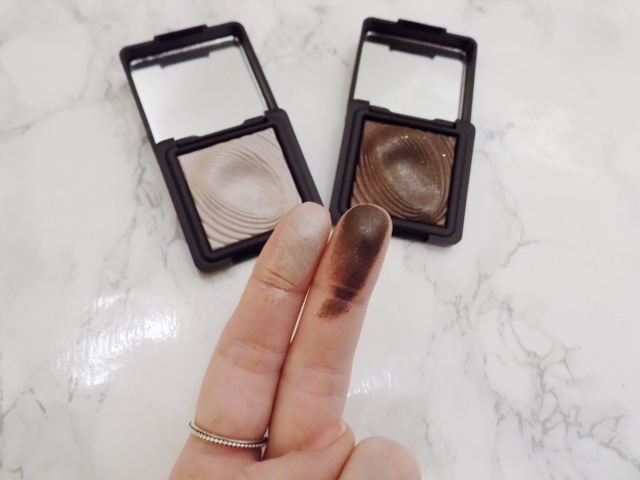 Next is the Long Lasting Wet & Dry Use Shadows which are, well shadows you can use wet and dry. The shades I have are 206 which is a shimmery dark chocolate-y brown and 227 is a light taupe almost with a pink duo-chrome. They're pigmented and as the name suggests can be used wet or dry. Look how stunning they are though. Next is the Cream Crush Lasting Colour Shadow in 01 which is a champagne gold kind of shade. 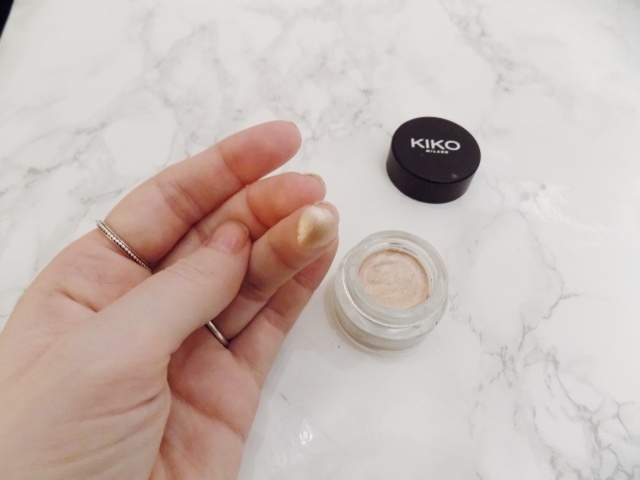 It's super creamy, applies really nicely and lasts a decent time on the lids too. 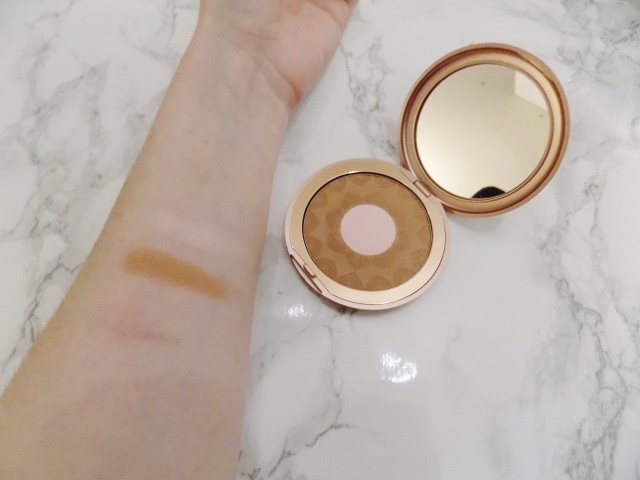 I guess this could be used as a cream highlight if you were in a pinch but it's a great cream shadow and will definitely be getting more of these. 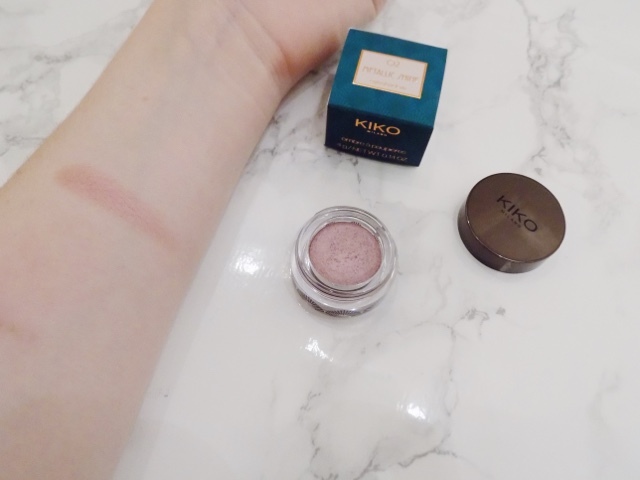 In my recent Kiko.com excursion I picked up the Metallic Shine Eyeshadow in 02 which is a nice soft velvety powder eyeshadow which is part purple/lilac/taupe and part rosy. I love the packaging for this shadow a lot though, looks very sleek and much more expensive. 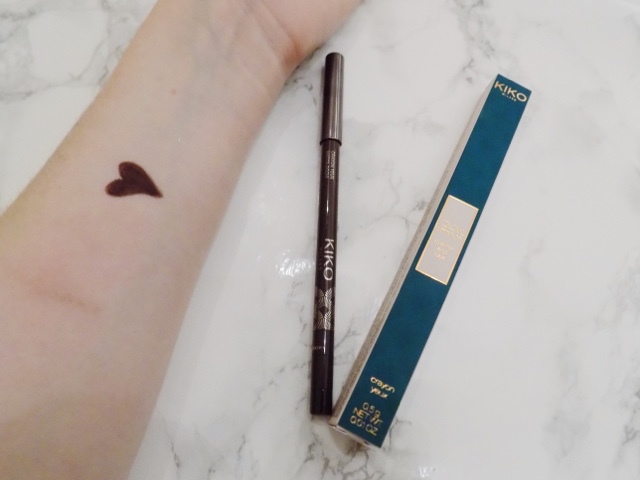 I actually got this Colour Definition Eyeliner & Kajal in 02 free with my purchase and it is such a beautiful deep aubergine purple yet still kind of brown sort of shade shade, and it's really pigmented and so creamy. I love to apply this on my top and bottom lash lines and smudge it out for a super easy and quick look. I love it and will be getting more of these. I really want to try some of their gel and liquid liners as well as an eye primer and brow products (as in obsessed with my brows recently). 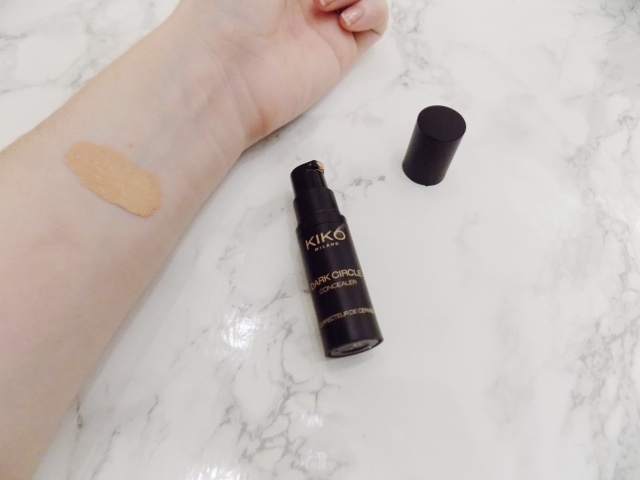 Now for the face and I wanted to try some kind of complexion product so I chose the Dark Circle Concealer in 01 Porcelain as it sounded great and very useful for my dark circles. But although I picked up the lightest shade, it's still about 5 shades darker than I need so I don't get a chance to use this. 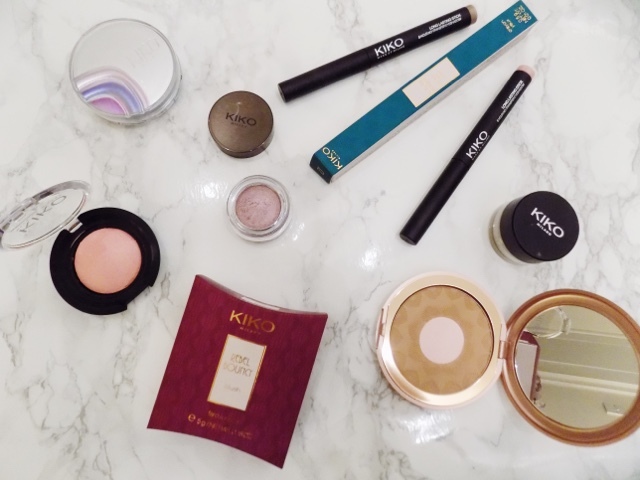 Although the peachy orange tone is good for counteracting dark circles. So I decided the complexion products weren't suitable for my skin tone so I moved on to their awesome array of cheek products. 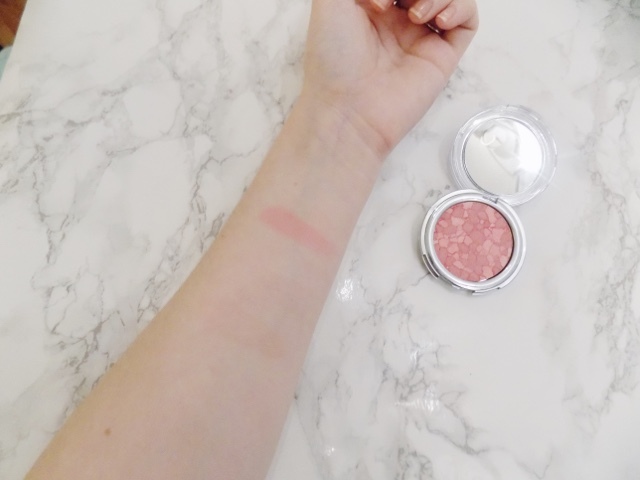 So first the Mosaic Blush in Luminous Baby Pink was my first blush and look at how beautiful it looks. It's a great natural pink kind of colour and it's not too pigmented that you have to be careful (the swatch was about 5 layers of product just to get it to show up on camera) but it gives a nice soft pink hue to the cheeks which is very flattering and perfect for an everyday look or for someone who isn't an avid blush wearer. Then I've tried some of their new-ish line and first of all, isn't the packaging just beautiful? 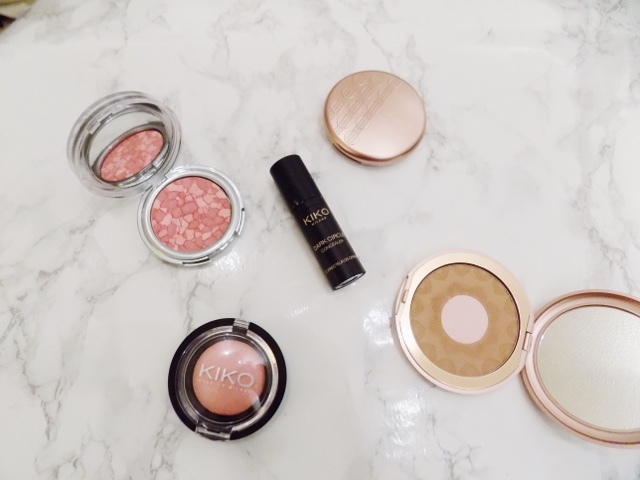 I love anything even a little rose gold and these compacts are beautiful. Even the boxes they come in are stunning. 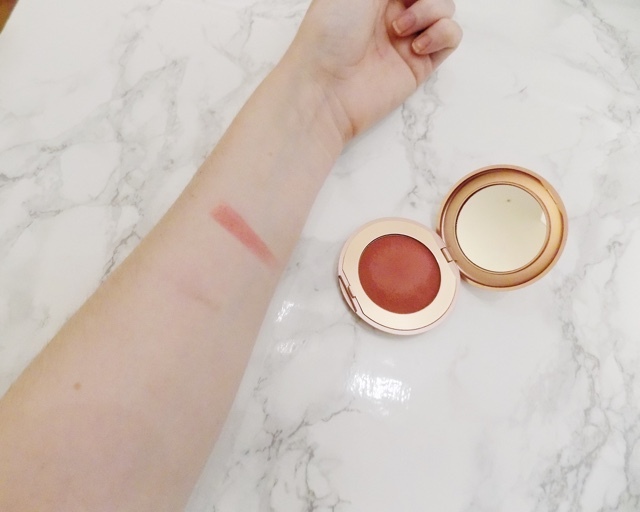 Anyway, the Rebel Bouncy Blush in 03 Treasure Road is a beautiful natural rose kind of shade, and it's such a unique product. It has a spongy appearance but I wouldn't say it's bouncy and when you touch it it's soft and creamy yet it has a satin matte finish on the skin. 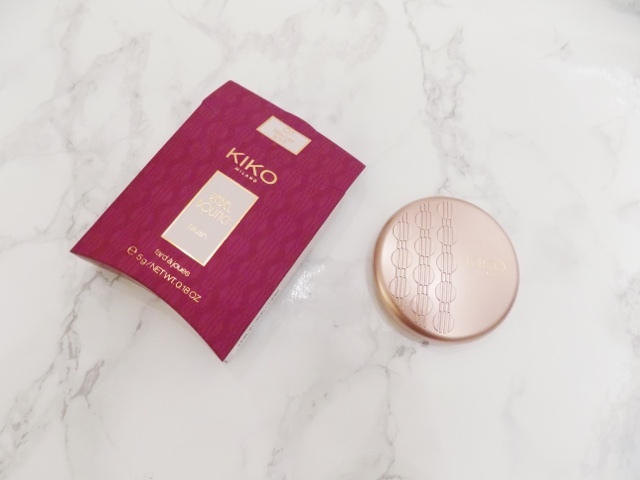 Also from the same collection is the Perfecting Bronzer in 01 Light to Medium, look, more stunning packaging and doesn't this look so pretty. The powders themselves are so soft and smooth and I just think how they go on the skin and blend is effortless and just fantastic. The bronzer looks slightly orange but when it's on the cheeks it's not that bad. They're incredible and for the price, they're fricking amazing. The Colour Veil Blush in 01 first off smells so fricking good and delicious. 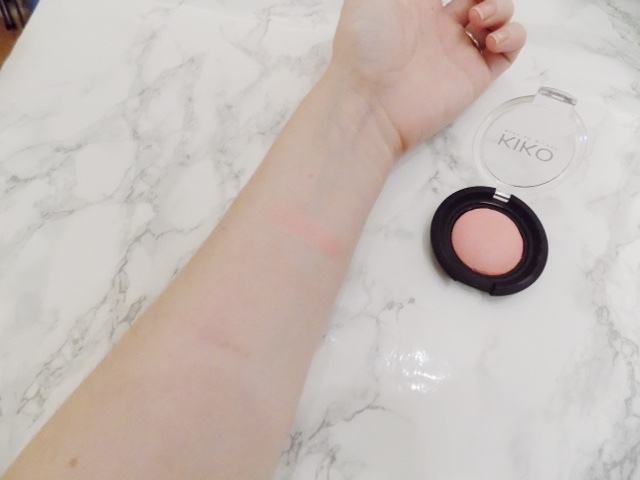 It's a light cool toned pink which has been baked so gives a beautiful radiant sheen to the cheeks. I love how it looks and feels and it's just an incredible product ts £3.90 and it's limited edition so if you want this (which I highly recommend you should) then get it quick. 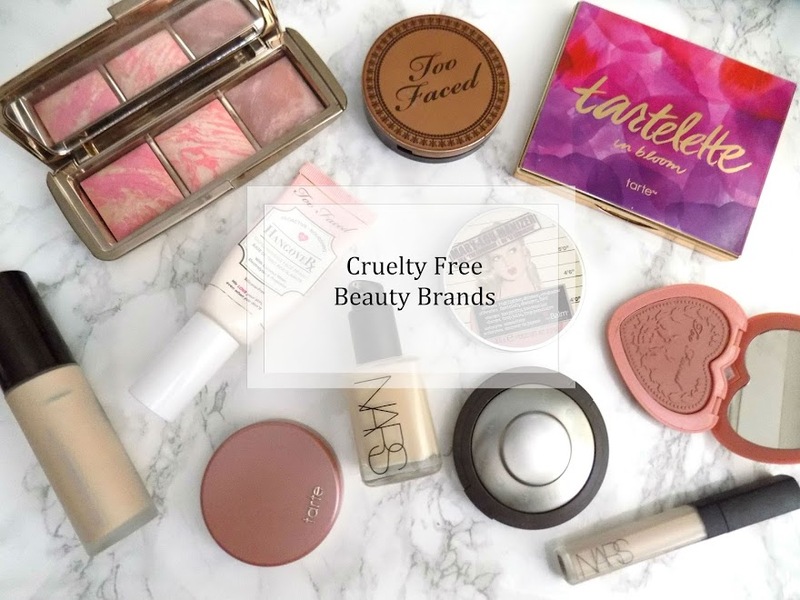 As base products are out of the question I am a massive fan of trying out their cheek products, they have other blushes, some contouring sticks that I have my eye on and lots of cream stick kind of products. I would like to try out a few of the primers and setting spray they have, plus a radiant highlighter which looks absolutely stunning. 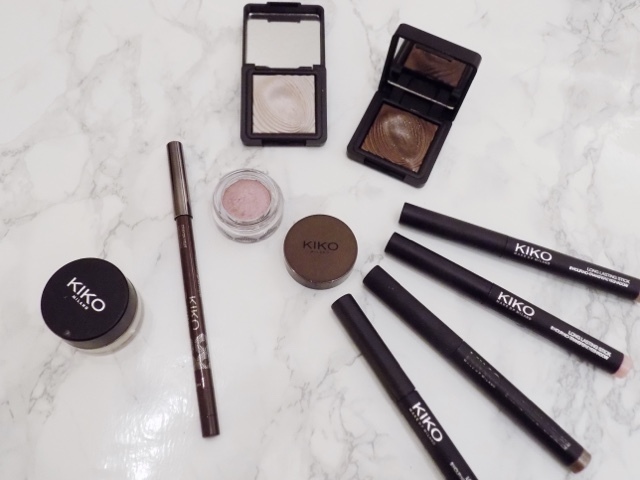 I hope you liked this introduction to this fantastic makeup brand. They also do skincare which I haven't yet tried anything from but I'm sure I will in due course.